BALTIMORE, MD – The players may be packing up and getting ready to enjoy some downtime, but for the Baltimore Ravens sales and marketing team, the game is just beginning. And just like their on field colleagues, this special team has a coach of their own to help them stay focused on the win. 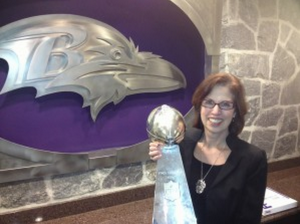 Susan Katz, owner of the Susan Katz Advanatge, has signed on to coach the Baltimore Ravens’ sales and marketing team. She’ll be helping the staff secure the sponsorships and develop partnerships that will enable the team to thrive next season. Katz first started working with the Ravens business management team about two years ago doing leadership development. Then, in November 2012, she developed a coaching relationship with the sales and marketing team. Now she coaches the team monthly with the objective of elevating performance, meeting goals and reaching a higher level of success. Katz may be coaching one of the city’s highest profile sales teams, but closing a six figure deal each month isn’t a requirement to use her services. She regularly coaches a wide variety of business owners, managers and sales professionals throughout the city. With more than 30 years of corporate experience, her success stories are numerous.